"Self-Portrait" (1954). Lithograph in five colors. "Two Boys Aged 23 or 24" (1966). Etching and aquatint on paper. This insightful and entertaining exhibit celebrates the 60th anniversary of David Hockney's first print. Dulwich Picture Gallery, London, U.K. In a leafy, affluent enclave of southeast London is Dulwich Picture Gallery. Designed by regency architect Sir John Soane (who also designed the Bank of England), this was the country’s first public art gallery. Founded in 1811, it is home to one of the finest collections of Old Masters in the U.K., particularly rich in French, Italian and Spanish Baroque paintings and in British portraits from the Tudor period to the 19th century. The gallery’s permanent collection is complemented by its wide-ranging and critically acclaimed year-round temporary exhibitions. “Hockney, Printmaker” coincides with the 60th anniversary of David Hockney’s first print and celebrates his long and diverse career as a printmaker. David Hockney is Britain’s best-known and arguably best-loved artist, and one of our most talented and innovative printmakers. Showcasing over 100 works, including rare early lithographs from his time at Bradford College of Art in the 1950s (a “Self Portrait” redolent of Stanley Spencer) and his recent experiments with the iPad and iPhone (“Rain on the Studio Window,” 2009), this engaging exhibition offers an insightful and entertaining overview of Hockney’s long career. The first room focuses on Hockney’s time at the Royal College of Art in the 1960s, where he quickly became a rising star of the British Pop Art movement. These early etchings, which include his series “A Rake’s Progress,” buzz with youthful ideas, energy and exuberance while also demonstrating Hockney’s command of the medium of printmaking. The works from the 1960s and ’70s also demonstrate key preoccupations in his creative output, including classical literature and poetry as sources of inspiration. His illustrations of poems dealing with homosexual love by the Greek poet Constantine Cavafy are sensitively drawn with spare expressive lines that create a tender eroticism. In his illustrations for “Fairy Tales from the Brothers Grimm,” we see Hockney experimenting with new ways of using the medium of etching with cross-hatching and references to earlier artists and genres, including Japanese art. Another significant thread of the exhibition is Hockney’s portrayal of his friends, including the textile designer Celia Birtwell, who has been a friend and model since the late 1960s. These prints are affectionate, warmly drawn, and highlight Hockney’s superb skill as a draughtsman as well as a portraitist. In later portraits from the 1980s and ’90s, the subjects drawn in thick expressive lines, Hockney offers uncompromising portrayals of the aging process. Subjects familiar from his paintings are also given prominence in the exhibition, with prints of swimming pools, plants, young men, California, weather and water, and examples of “progress proofs” showing how the final work is conceived and produced. A group of colorful lithographs trace a clever line between illusion and the artifice of the medium, with subjects drawn from the artistic styles du jour, whose witty printed frames create a sense of immediacy. The final room of the exhibition focuses on more recent work, including Hockney’s experiments with new technology: the humble office photocopier, the laser printer and the iPhone and iPad. Even in his iPad pictures, his skill as a draftsman is more than evident alongside his constant willingness to explore new techniques. 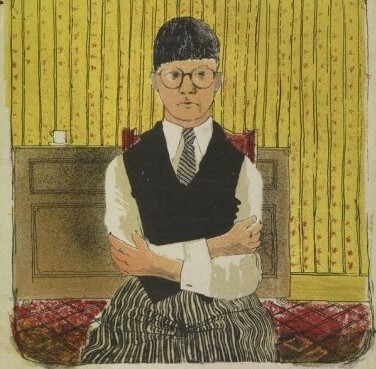 This splendid exhibition may be small (arranged over just five rooms), but in the range and wealth of work on display, it amply demonstrates Hockney’s exceptional skill as a practitioner of the medium of printmaking and his extensive knowledge of the techniques and work of fellow printmakers throughout the ages, including Picasso and Matisse.